I should have been doing this six weeks ago. Racking, that is. Syphoning the young cider off the spent yeast into a clean container, ready for a further few months settling. An easy enough job, except for the final moments in which care has to be taken to ensure that yeast isn't sucked up the pipe. There is always a bit of yeasty cider left at the bottom that gets wasted. The 2011 pressing is shaping up well, though it tasted as you'd expect from a young cider it was very palatable and showed plenty of promise. I ferment my cider in big plastic jerry-cans sold to caravanners to carry drinking water. Not very conducive to photography I'm afraid. I did however ferment one demijohn of a special cider, of which more on this blog in due course. 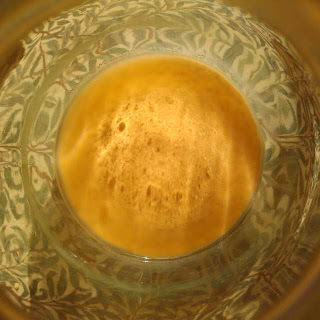 The picture shows the spent yeast immediately after racking, the texture being exactly as it was under the cider. I have no idea what mechanism makes the yeast settle with holes in the upper surface like that.